Although the descriptions of a unicorn's appearance may vary according to the region, stories of this creature can be found with origins throughout the world. The legend of this mystical animal dates back as far as the ancient Greeks. 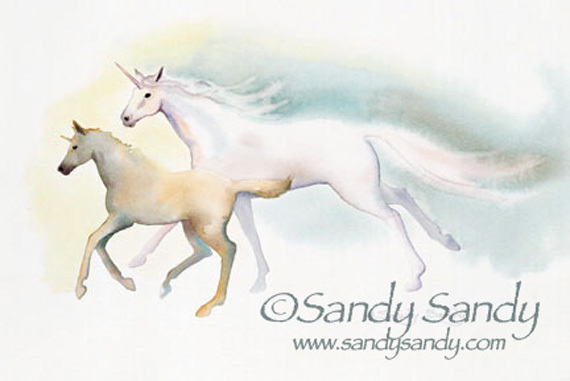 Later in history, references in the Bible connect unicorns to virgin saints and they became a symbol of purity. Despite the fact that unicorns were said to be wild and at times vicious, one could easily be tamed by a virgin's touch. During the Middle Ages, the dust filed from a unicorn's horn , or alicorn, was a popular ingredient used in magic potions that were thought to be highly effective against poisons and all malignant ills. The horns were so prized that they were kept in the vaults of royalty. Great artists such as Leonardo da Vinci and Albrecht Durer have tried to capture their likeness on paper. Many stories, songs and poems have been written about them. One such story being that the reason that no known survivors exist today is that they never made it aboard the Ark, as they were off gallivanting when it was time to go. Whether or not the unicorn is or ever has been real, one thing is certain, the unicorn is alive and well today! They will continue to live on in the hearts and minds of many creative, sensitive and caring people; individuals for which faith and belief do not depend on congruity of actual fact.